In LO Tips for Traveling with a Baby, caregivers share their experiences traveling in destinations throughout the world with their Little Ones. How old was your Little One at the time? Breastfeeding: What are accepted places for women to breastfeed? Is it accepted to breastfeed in public? In Tel Aviv, I breastfed everywhere — in restaurants, on buses, on park benches, while walking down the street in broad daylight. In the beginning, I covered up for my own comfort. Later on, I stopped covering up. No one minded. In fact, one popular restaurant chain was known to give women free orange juice when they saw a woman breastfeeding as a way to support nursing women. Food/Water Safety: Was the water potable in your destination? Was the food safe in your destination? If either was unsafe, how did you deal with that? Water is potable in Tel Aviv, and food is perfectly safe. Formula/Milk: What sort of formula selection did you find and where did you find it? Was pasteurized whole milk readily available? I found formula in drugstores, including SuperPharm, a popular chain. Restaurants: Were restaurants equipped with high chairs? How did restaurant staff treat your Little One? We were in Tel Aviv before the time when my baby would’ve used a high chair. Restaurant staff was always wonderful with my baby, making sweet faces or nice comments. But family restaurants were, surprisingly, not always equipped with changing tables in the bathrooms. Navigating with Little One: Was your destination stroller-friendly? Did you use a stroller/carrier? Did you face any challenges with either? Do you recommend any strollers/carriers? Tel Aviv is stroller friendly, though many apartments do not have elevators. Our baby lived in the Ergo Baby 360 carrier while we were there, and carriers are extremely popular in Israel. Other ubiquitous strollers are the Baby Jogger City Mini and the Babyzen YOYO. Both are made for city living. Public transportation: Which types of public transportation were/not amenable to traveling with your little one? While LO was an infant, all types of public transportations were fine. On intracity buses, you need not fold up your stroller, but it can get a little cramped. On intercity buses, you need to store your stroller in the bottom trunk. We mostly took our baby around in a carrier. Car seats: What are the local car seat regulations? If you traveled with a car seat, do you recommend one specific kind? Babies do not need to use a car seat in cabs, unless they are leaving the hospital for the first time, but we always did. We used the Graco car seat, which clipped into the Baby Jogger City Mini. Changing facilities: Did you find that your destination offered a great or small selection of diaper changing facilities? For such a baby friendly society, Tel Aviv did not offer as many changing stations as I had expected. I rarely found them in restaurants or hotels, so I either changed LO’s diaper on a ledge, in the stroller, on park benches — anywhere that seemed feasible. Luckily, the weather is often nice for outside diaper changes. Diapers: Where did you purchase diapers? Which brands were sold? You can purchase diapers in drugstores, like SuperPharm. They had everything from Huggies to Pampers to Life, an Israeli brand that’s cheaper. We used Pampers and Life. They were great. If you experienced a medical emergency/concern during your trip, are there any hospitals, medical centers, or doctors that you recommend? Our LO was born in Israel, and is a citizen so our experiences were a little different. But, in Tel Aviv, I feel confident saying that most doctors speak English. Out-of-pocket costs at hospitals will not be exorbitant. You’ll pay nowhere near what you’d pay without insurance in the United States. For example, I had a c-section, for which I paid out of pocket. Everything — including pre-op testing, the surgery, and the five-day hospital stay — cost me $4,500 USD. Tel Aviv hospitals include Ichilov, which has a children’s ER, and Tel Hashomer, which is located in nearby Ramat Gan. What were the local attitudes about Little Ones? How was your Little One treated overall? Tel Aviv is a baby friendly city. There are tons of parks, restaurants welcome babies, and you will see babies all over the city. Locals love babies, and will constantly stop caregivers on the street to offer their comments and unrequested advice. As a new mom, the latter was somewhat jarring. I was constantly fielding the intensely doled-out advice from complete strangers — often letting me know that I was holding or dressing my baby wrong. This is very common, and I usually laughed it off, though sometimes I followed it. What were the greatest challenges in traveling with your Little One? Probably the lack of changing tables. 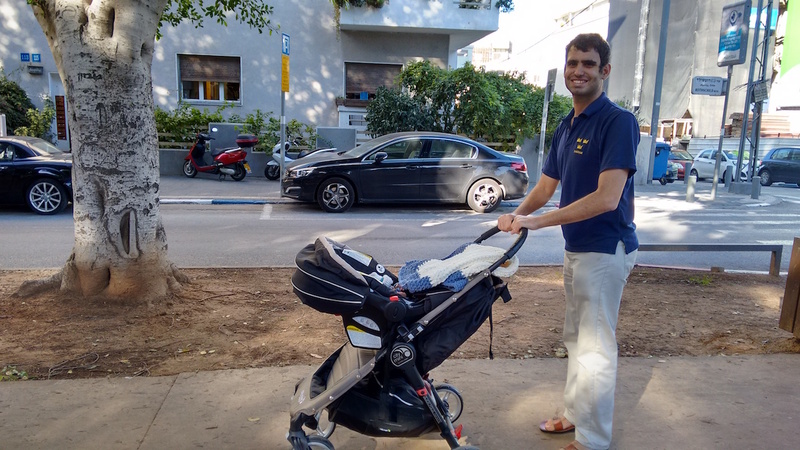 Israelis change their babies anywhere and everywhere, but as a new parent who was not used to quick and easy diaper changes, this took getting used to. Was there anything you wish you’d known about traveling in your destination with your Little One? That I wouldn’t need a special breastfeeding cover. That was definitely an item I didn’t need to buy for Tel Aviv. Rachel Sales is a writer, entrepreneur, world traveler, wife, and mom. She is the founder of Little One Travel.